1: Are growing property tax burdens behind the decline in Illinois home values? Skyrocketing property taxes, a sluggish state economy and Illinois’ outmigration crisis could spell trouble for the housing market. Most people view their decision to buy a home at least in part as an investment. For most households, the net equity in their home represents the bulk of their net worth. But it’s more than just a financial decision – it’s a sign of trust and certainty in the future of a given community. 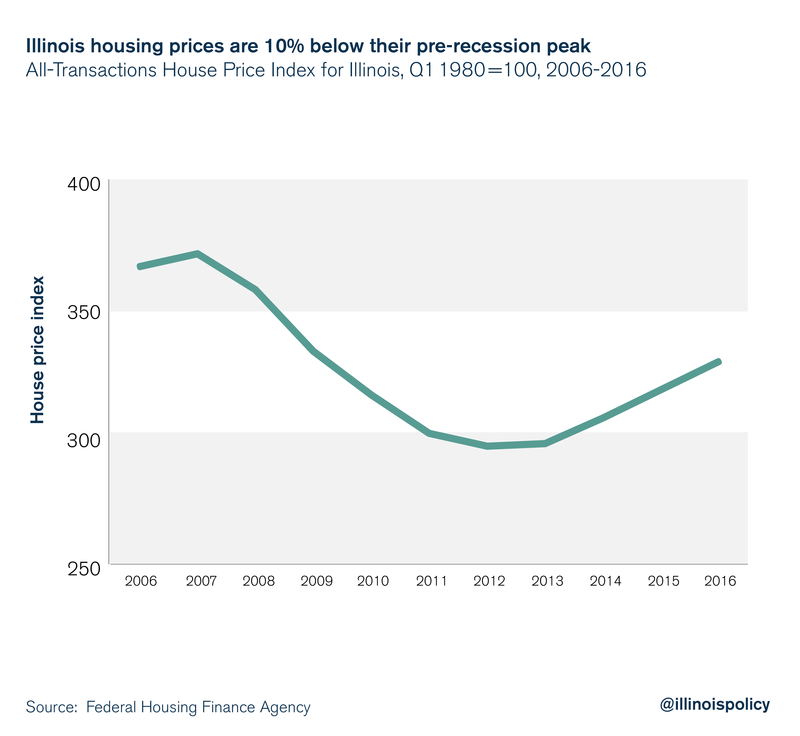 Unfortunately, government data suggest home prices in Illinois are still down 10 percent compared with 2006. And over the same time, property tax bills have gone up more than 51 percent. That doesn’t inspire confidence or certainty for prospective homeowners. 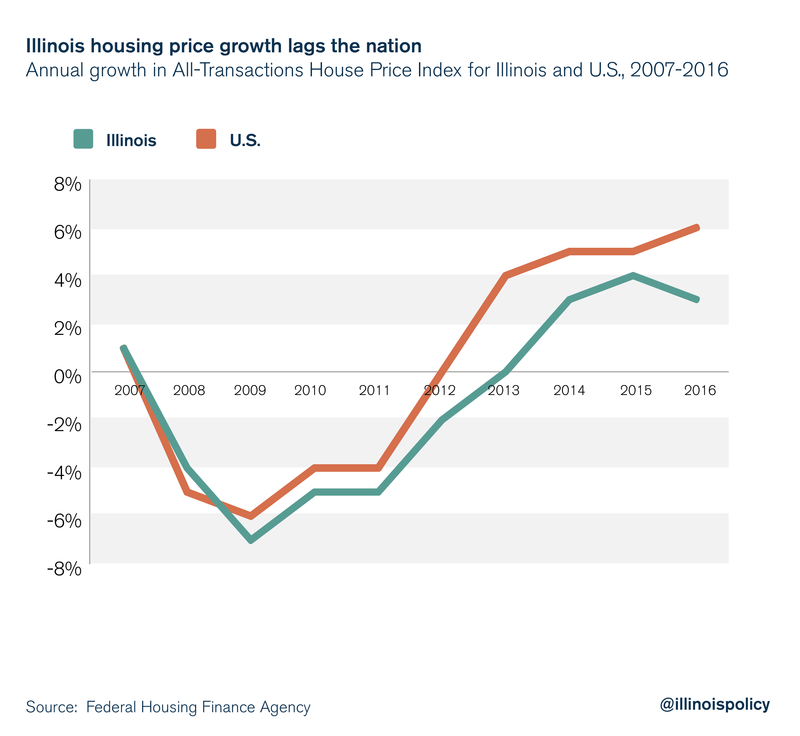 Although home prices in Illinois have started to increase again since 2013, home prices are still down 10 percent compared with 2006, according to research by the Federal Housing Finance Agency. This weak recovery is prevalent across the state. Meanwhile, Illinois’ nonfarm personal income (adjusted for inflation) grew by just 10 percent over that time, according to the Bureau of Economic Analysis. Compared with the nation, Illinois has been a laggard in terms of housing appreciation. Are growing property tax burdens behind the decline in Illinois home values? Illinoisans have seen their property tax bills grow six times faster than household incomes. Are those bills driving down home values? The dependence of local governments on property taxes has been justified traditionally with the claim that an increase in the tax rate has little to no effect on the tax base. One explanation offered for why property taxes may not lead to changes in property values is that taxes are used to finance public services that may benefit homeowners and businesses. When property ownership is related to individuals’ use of goods provided by local governments, such as schools or parks, then property taxes can be justified as user fees, implying that it is the provision of amenities – not property taxes – that lead to changes in property values. However, research shows that an increase in the property tax rate has a negative effect on property values, even after accounting for local public services. From 2006 to 2016, nearly 276,000 households left the state on net, according to IRS tax data. A reduction in the number of households in Illinois could have serious negative consequences for the housing market. A decrease in housing demand is expected to cause housing prices to decrease. But the relationship between population and housing is complex. On the one hand, population change leads to a changing demand for housing. Population growth – and the growth in the number of households – leads to growth in housing demand. Population decline might lead to a decrease in housing demand. This will, however, only happen in the long run, after not only the number of people but also the number of households has started to decline. The danger of population decline is greatest in rural areas and in areas with lower-quality housing. On the other hand, an increase in the supply of housing that puts downward pressure on home prices stimulates population growth through migration. Adequate housing supply might attract migrants or influence where they choose to live. Economists Dragana Cvijanovic, Jack Favilukis and Christopher Polk found empirical evidence that predictable demographic changes related to fertility and mortality rates have no effect on housing values. However, it’s the non-natural component of population growth – growth due to new migrant households – that causes home prices to rise. Economist Albert Saiz found that a migrant household inflow equal to 1 percent of a city’s population is associated with a 1 percent increase in average rents and housing values. New migrant households push up rents and housing values in cities. And recent economic research highlights links between regional labor and housing markets. Researchers found a strong negative correlation between an area’s housing prices and the area’s unemployment rate. The authors found that after a negative economic shock – the last recession, for example – areas where housing prices declined the most also experienced the highest decline in employment. This means that if Illinois’ economy continues on its current path, areas with large decreases in housing prices would also experience large decreases in employment. This is because a large decline in housing prices leads to a large decline in local spending that further depresses the economy. Fewer people are looking to plant roots in Illinois because of tax hikes that have reduced investment flows, causing the quantity and quality of jobs to decrease. Employment growth in Illinois is lagging the rest of the nation and could actually get worse. If home prices begin to decline, the labor market could take another hit. In order to move Illinois back from the edge of disaster, the right policy prescriptions would be to reduce property taxes across the state in order to make buying a home in Illinois a worthwhile investment again. To make that realistic, lawmakers must address the main cost-drivers of government. A good place to start is consolidating the state’s nearly 7,000 units of local government, which fuel high property tax bills. Enacting long-term property tax relief would gift greater certainty to homeowners residing in the Land of Lincoln, not to mention homeowners-to-be. Researchers have relied on two main types of data sources to investigate housing price movements. Both have serious issues that limit their usefulness in a variety of applications. The first category consists of value measures such the American Community Survey, the decennial census or Zillow’s home value index, which all confound price and quantity changes. Unfortunately, median or average sales prices are not a good measure of appreciation. Movements in sales prices should not be interpreted as measuring changes in the value of a home. Prices are influenced by changes in costs and also by changes in the characteristics and size of homes actually sold. For example, if for some reason in a given year a disproportionately high number of high priced homes were sold, the median price would rise even if no single property appreciated at all. The second category consists of proprietary price index data such as Black Knight, CoreLogic or Case-Shiller, which are produced using limited transactions data prior to the late 1980s or early 1990s, forcing reliance on geographic pooling of transactions, smoothing of series over space or time, or limiting coverage. To address this gap in the availability of constant-quality house price measures, economists at the Federal Housing Finance Agency used data from nearly 100 million transactions to construct a comprehensive set of annual house price indices over four decades for cities, counties, 3-digit ZIP codes (ZIP3s) and 5-digit ZIP codes (ZIP5s). 1 IPUMS USA collects, preserves and harmonizes U.S. census microdata and provides easy access to this data with enhanced documentation. Data include decennial censuses from 1790-2010 and American Community Surveys from 2000 to the present. IPUMS show the average property tax bill per homeowner-head of household in Illinois increased 51.4 percent from 2006-2016.